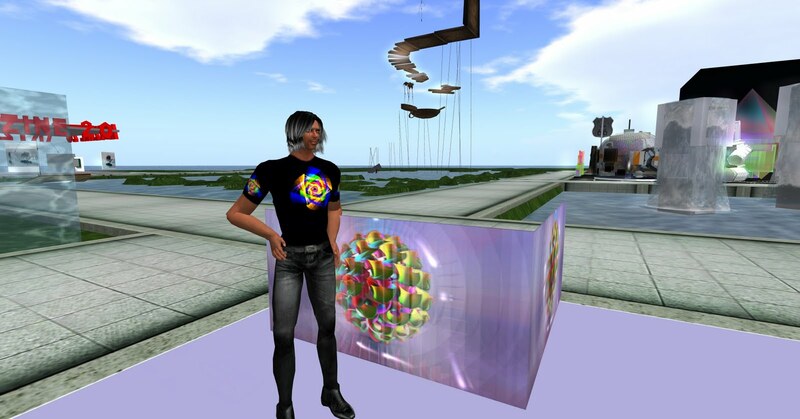 Right before SL7B ended, I met SL resident and artist Solkide Auer in front of his creation “Colors from the Void." The exhibit was fantastic. If you touched the base of the exhibit, you were instantly placed high inside the colorful ball. What a view!!! Solkide and SL artist Shellina Winkler originally created the exhibit for an international event, Through the Virtual Looking Glass. This event happened in both SL and RL at the same time. Sixty artists exhibited their work in SL, and at the same time the works were presented in four RL locations, Boston, Amsterdam, Nice, and Australia, through megascreens linked to the exhibits in SL. Although Solkide participates in many SL art events, this was his first time to participate in a SL birthday celebration. He said he saw many beautiful works during SL7B. “For me it was important also to be here for the birthday of this fantastic world,” he said. Solkide is an interesting, international SL resident. While his RL counterpart resides in Pescara, Italy, Solkide is busy perfecting his art in SL and beyond. 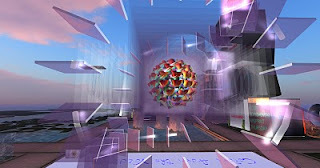 He currently exhibits his work in his own gallery Italic’Arts, located at Slitheen (176,41,76) and in a French gallery. In March 2009 some of his works were displayed by monitors in Adriano's Temple in Rome, Italy, during an exhibition about Digital Art. In October, 2009, five of his works were exhibited at "Virtual Renaissance" in Florence, Italy, in the Anthropological Section of the Museum of Natural Science. He has also participated in Burning Life simultaneously here in SL and at the Burning Man exhibition in Nevada. Solkide and Shellina worked together during Burning Life 2009. They had each participated in Burning Life 2008, but with separate exhibits. Solkide Auer is an artist to watch for in both SL and RL.